The metamorphosis from postdoc to principal investigator is one of the most exhilarating transitions in the life of a scientist. Nicole Francis, who was recently appointed Assistant Professor in the Department of Molecular and Cellular Biology (MCB), is presently in the midst of it. She’s getting her Harvard lab in the Fairchild Building up and running so she can continue her exciting line of research—unraveling the puzzle of how Polycomb Group (PcG) proteins influence the stability of gene expression through generations of cell division. Somehow, PcG proteins help preserve gene expression patterns set up by the sometimes fleeting actions of transcription factors. PcG proteins therefore play an important role in the stability of a cell’s identity—in essence, its ability to remember its role. Francis, who earned her PhD in neuroscience, began the journey on her current research trajectory when observing the diversity of neurons in the brain. 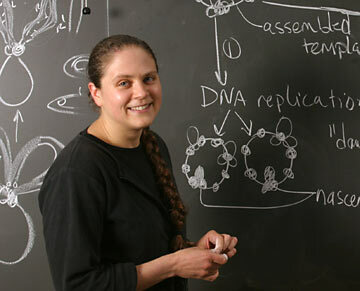 She came to understand that this diversity must reflect different patterns of gene expression. Understanding how differential patterns of gene expression creates neuronal cell diversity led her to the literature on changes in chromatin structure associated with gene regulation. Surprisingly, changes in chromatin structure may persist through cell division, even when the molecular events that brought about the change are gone. Thus, the dynamics of chromatin structure opens into the larger story of cellular memory. How could this work? Her search for an answer brought her to the Robert Kingston lab in the Department of Molecular Biology at Massachusetts General Hospital in Boston. The Kingston lab studies the biochemistry of chromatin remodeling, and as part of that research the lab embarked on biochemical purification of PcG complexes, which were thought to act through chromatin structure. Despite awareness of the fascinating biological role of PcG genes—maintaining essential gene expression patterns and keeping generations of cells “on script”—nothing was known about the biochemical activities of these proteins, or how they might affect chromatin. The opportunity to study PcG proteins appealed to Francis because they were the only clear example of proteins involved in maintaining transient transcriptional regulatory events—a process that seemed likely to be central to the choice and maintenance of cellular identities. Evidence supports the hypothesis that most—if not all—of the PcG proteins are involved in silencing gene expression—or rather in maintaining the silence of gene expression. But understanding the mechanisms of this complicated process is a difficult matter. Whereas one or two transcription factors can be key to a gene’s expression pattern, so far at least 15 Polycomb genes have been identified. It is a daunting task to decipher how this large number of PcG proteins engages the various levels of chromatin, from nucleosomes to chromosomes, to lock in gene expression in generation after generation of cells. After a researcher in the Kingston lab painstakingly purified PcG proteins from Drosophilamelanogaster embryos to examine their role in chromatin remodeling, Francis recognized the new opportunity to develop biochemical assays in order to study PcG proteins. She embarked on setting up simplified systems. “If we start with these simple systems and really understand molecular interactions, then [we] can gradually build up to a more complicated system,” she explains. To date, Francis and her colleagues have looked at about 50% of the PcG proteins and have identified some of their activities. For instance, several PcG proteins reside in the Polycomb Repressive Complex 1 (PRC1), which inhibits chromatin remodeling and transcription in vitro. PRC1 also likely alters chromatin structure through interaction with nucleosomes. “But there’s a lot these proteins are doing that we haven’t identified yet,” says Francis. In her Harvard lab, Francis intends to tackle how gene silencing by the PcG can be inherited through cell division. This will involve bridging the fields of cell division and transcriptional silencing. Cell division is an enormous field and a new area for Francis. In venturing into this new territory, she’s pleased to be part of the collaborative environment fostered within MCB and especially looks forward to working with Harvard colleagues such as Matt Michael, a researcher in the forefront of DNA replication and repair mechanisms. She is invigorated by the challenge of following in the footsteps of renowned scientists who paved the way for her generation of researchers, scientists such as Roger Kornberg whose groundbreaking research at Harvard in the 1970s introduced the scientific community to nucleosomes. Using modern-day biochemical approaches, the Francis lab will be looking at what happens to PcG protein interactions with nucleosomes during DNA replication and mitosis to discern how, from the get-go of chromatin formation and on through the higher levels of chromatin structure, PcG proteins mediate cellular inheritance. As well as increasing understanding of the biochemical activities of PcG proteins, Francis hopes to learn more about how PcG proteins affect chromatin folding and structure. How chromatin is folded appears to be key to how genes are silenced and perhaps also how silencing is remembered. Francis initiated this line of inquiry while working with Bob Kingston, using electron microscopy in collaboration with the Christopher Woodcock lab at the University of Massachusetts, Amherst. She hopes to continue using high resolution imaging to study PcG effects on chromatin, and perhaps to foray into single molecule studies, again in collaboration with colleagues in MCB and neighboring departments. For further reading, see Francis, N.J., Kingston, R.E., and Woodcock, C.L. (2004) Chromatin Compaction by a Polycomb Group Protein Complex. Science 26: 1574-1577.